I have been allegorically wandering in a musical desert for the last 41 years. I have played in all kinds of bands, orchestras and ensembles, and have absorbed most of my music theory via osmosis. Right now, I am taking a pre-requisite class to the 2 year music theory program I would like to begin this fall. Lo, I have been led to the Promised Land of the Circle of Fifths (and no, that’s not an alcohol reference, folks). It’s SO COOL. Why didn’t I get any of this stuff along the way? Love, lovin, lovin it!!! 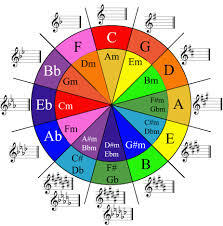 It’s the Circle of Fifths AND a wardrobe color chart. I think I want to dress in B major with an accent of D minor today.